This is a rather ominous seven-day rain (plus moisture contained in snow) amount forecast. I have reviewed the morning longer range models and they continue to have at least moderate amounts of rain falling from day 8 to 15. Some of the models have total amounts approaching 25 inches in the Sierra with commensurate amounts at lower elevations. So, if you are going to be traveling to/from or within California the next two weeks or if you live near a small stream, you may wish to compare accordingly. I think you've posted this already, but according to the latest PDSI, there is *no* drought in CA. 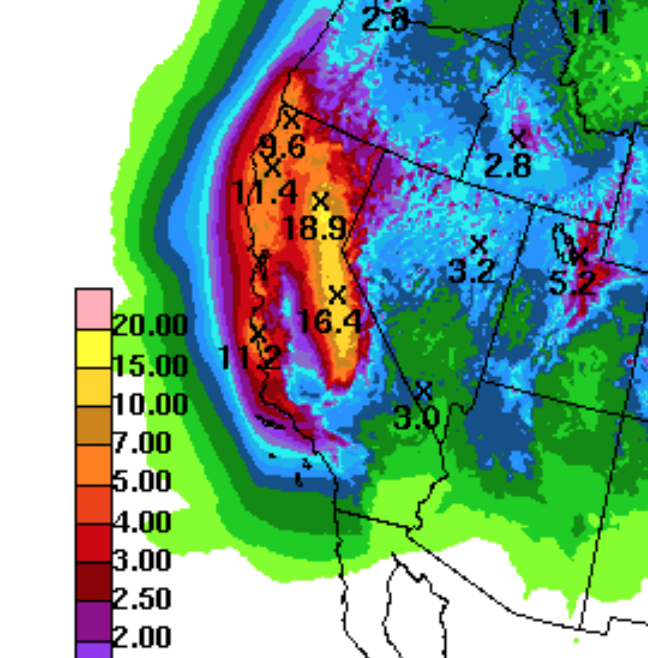 However, one map still shows a trace to 3" needed in two SoCal zones to bring the PDI to -0.5. Which looks like it will happen.